At High Speed Technologies, Inc. we know GenSwiss* Spindle Repair and Rebuild for live tooling and PCM spindles. We repair them to OEM like new performance with a full warranty. Call 1-603-483-0333. GenSwiss spindles are used on a variety of Swiss Lathes including Citizen, Star, Tsugami, Tornos and VDI. HST can repair GenSwiss spindles used on these lathes. At HST we repair multi-head, speed increaser and thread whirling spindles manufactured by PCM GenSwiss for a fraction of the cost of new. See some examples of our GenSwiss Spindle repairs below. HST Repairs PCM GenSwiss 3X speed increaser and thread whirling spindles. 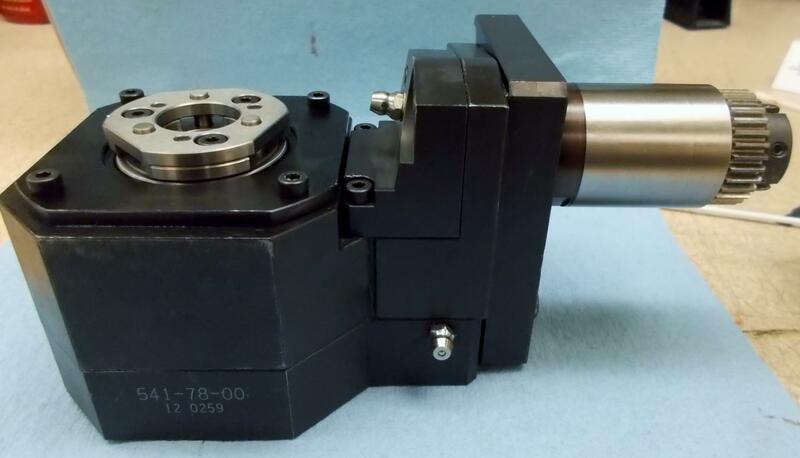 If you use GenSwiss gang slide live tooling on your Citizen machine or other Swiss lathe machines we can repair them for a fraction of the cost of new. We repair the following GenSwiss Spindles used on Citizen CNC lathes and verticle mills. Genswiss manufactures thread whirling spindles for several different models of Swiss lathes. HST repairs all Genswiss Thread Whirling spindles. This thread whirling spindle is grease lubricated. But when we opened it up we found that the lubrication had been washed out by an unknown liquid contaminate most likely the tool coolant used with the whirling process. HST replaced all of the bearings and seals. The thread whirling spindle performed like new after our rebuild. The grease lubrication was washed out of the bearings on this GenSwiss thread whirling spindle. HST will replace all bearings and seals. After HST comprehensive spindle rebuild this thread whirling spindle preformed like new. We provide an OEM equivalent warranty with every repair. Some form of contamination got past the seals of this spindle. When we opened it up we found that the bearings were no longer serviceable. The contamination was pervasive. All components were thoroughly cleaned and new ABEC 7 super precision bearing were installed. We also replaced all seals and repaired all sealing surfaces. Contamination is evident in all parts of this thread whirling spindle. This GenSwiss Thread Whirling spindle is completely rebuilt and ready to go to the test stand. No spindle will ship unless it passes our stringent test program. When we turned this spindle by hand the bearings definitely felt rough. Once it was opened right away we could see that some unknown liquid, most likely tool coolant, washed the grease out of the bearings. The Bevel Gear cover was also broken and was the likely point of migration for the contaminating liquid. HST always repairs or replaces all damaged covers. They are critical for maximum life of your spindle. The broken bevel gear cover allowed liquid contamination to ruin the bearings. At HST we repair a lot of GenSwiss 3x spindles. And often our repairs are better than OEM new. One way we do that is by using better bearings. The OEM bearings that we take our have steel cages. At HST we install top name brand, ABEC 7, super precision spindle bearings with phenolic cages. Our top line bearings are the best you can buy. So our customers get a rebuilt spindle that is as good as or better than new for a small fraction of the cost of new. And with an OEM equivalent warranty. The PMC GenSwiss GSC-510-3X is a speed multiplying spindle that can increase the spindle speed up to 15,000 RPM. So now your 5,000 RPM live head can do high speed cross drilling or milling operations. The original bearings used steel cages. At HST we replace those with GMN super precision spindle bearings with phenolic cages. When we finish repairing a GenSwiss GSC-510-3x they run better than new. We usually get the GenSwiss GCS-510-3X spindles in 2 or 3 at a time. Job I-1450 was one of three other similar repairs we did at the same time. These 3X speed increasers are compact and reliable. But like all high speed spindles they are susceptible to contamination. To learn a little more why high speed spindles are so susceptible to contamination click on this link. Contamination permeates the gear housing. Some fretting corrosion is visible on the pinion shaft. At HST we will correct all of these issues. GenSwiss offers several spindles that provide multiple head drilling / milling capacity. The GSE-1307 is one that provides three spindle output; a very versatile adaptor. HST can repair your GenSwiss GSE-1307 spindle to like new condition. 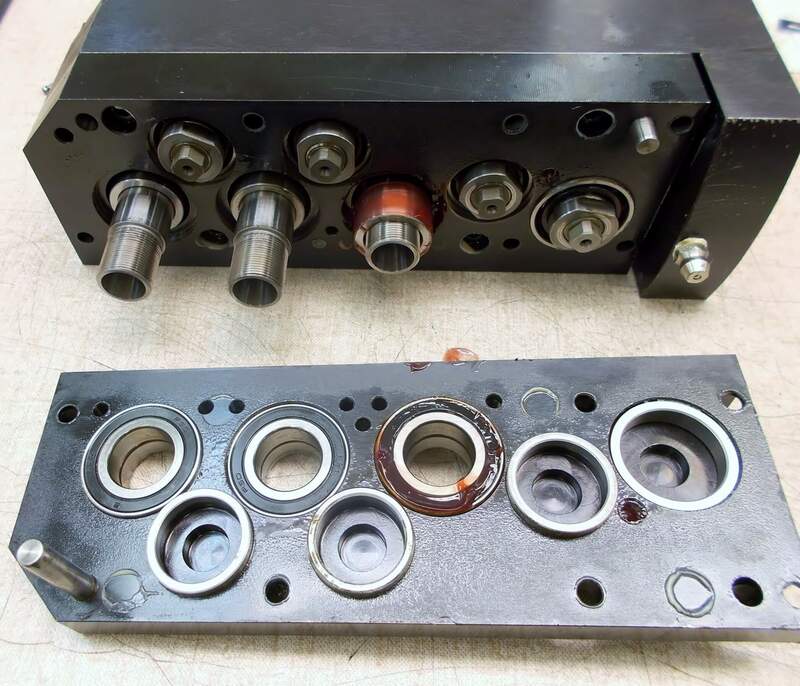 We replace all of the bearings and seals, set preload and make sure that the unit performs like OEM new. Our work comes with a one year warranty. With these spindle each head is treated like a separate spindle. So in effect it is like repairing three spindle with a common gear drive. Before shipping each spindle must pass our stringent test procedures. HST rebuilds GenSwiss GSE-1307 Spindles. All bearings are replaced and gear spacing set. The unit will be fully tested and must pass our stringent criteria. HST rebuilds all GenSwiss multi-head Spindles. *GenSwiss is a trademark of Genevieve Swiss Industries. HST is not affiliated with Genevieve Swiss Industries.